"E.Z. to make pie. 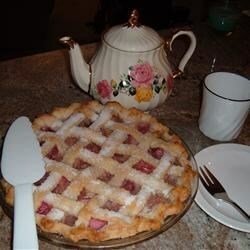 Can be made from store bought ready made pie crust." Preheat oven to 400 degrees F (200 degrees C). On a lightly floured surface, roll out one crust, and place in a 9 inch pie plate. Roll out top crust, and set aside. In a large bowl, mix together rhubarb, pineapple chunks, sugar, and tapioca. Place in pie crust. Cover with top crust; seal and crimp edge. Brush with milk, and cut a few slits in the top to allow steam to vent. Bake in preheated oven for 45 minutes, or until crust is golden and liquid bubbles in the center. I read this review and ended up making it exactly as the recipe called for - I used Minute tapioca. The pie was excellent! My husband and his friends love it. Thanks.